Sunit Computer Technology is from Top-of-the-World, Finland. Our products are well known to be reliable in the toughest working environments. We claim us deep knowledge of the Client-entrepreneur and strive to bring long-term technology with retained value. Every Duty is unique thus we serve with Client-adapted products. An Open Architect Computing obtains service, development and deployment easier thus upkeep-cost of ICT is reduced. OAC ensures that Applications are optimally powered and the Life-time of Information system is entitled. 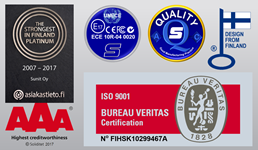 In Product technology and Manufacturing process we follow Industry Standard ISO-16750 and Products are globally E-Certified. The environment is significant aspect on Industry world and calls for contributes toward better environment by value added technologies. The Electronic industry itself impacts Environment severely and Sunit realize that best contribute is to supply products for extremely long In-service time. SUNIT-iVia IoT Server is build for Open-Architecture Applications. 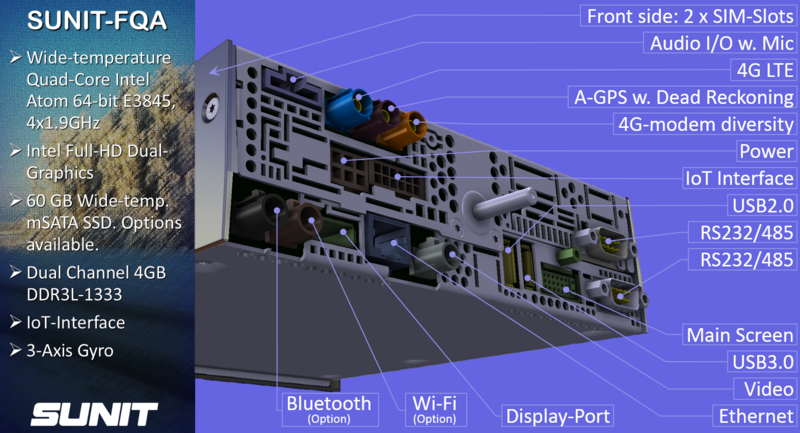 It serves with Interfaces toward Core-sensors, CAN, Cloud and Short-range communications. An Open Architecture makes both maintenance and service development and deployment easier, indeed the Life-cost of a modern application is decreased. SUNIT-I All-in-One Panel-PC for Industry Applications. SUNIT-I with Wide-View technology is ideal HMI-Monitor for Environments with tough working demands. Smooth design and lightweight suits excellent for mobile units as well. Powerful Ultra Low-Voltage processor with Smart-speed technology offers optimized Processor capacity for all Applications. 2 x Speakers offers excellent Audio features. 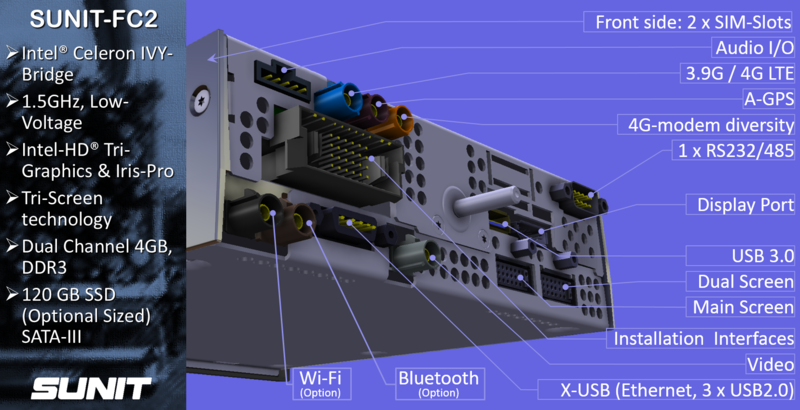 SUNIT-I Panel-PC is connected thru Wi-Fi, USB, Serial or LAN interface. SUNIT-T All-in-One Panel-PC for Industry and Fleet Applications. SUNIT-T with Wide-View technology is ideal HMI-Monitor for Environments with tough works. Graphics-Accelerator and sharp TFT-LCD Display with Auto-Ambient controlled LED-Backlight offers user-friendly Screen-interface. 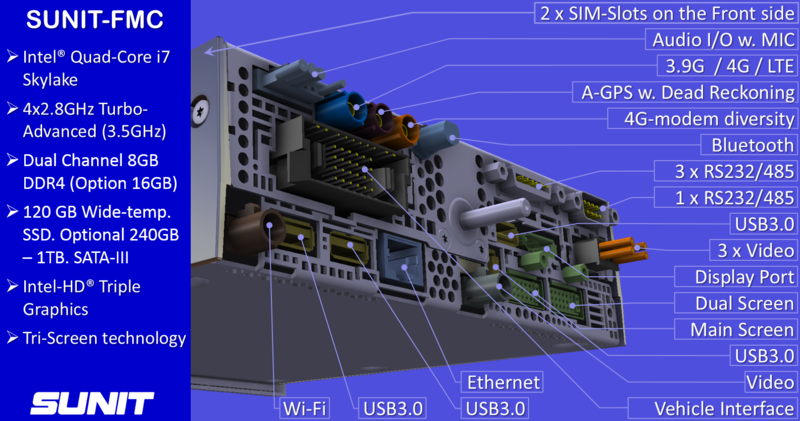 Integrated SIM-Slot with 3G Modem and 72-channel GNNS offers excellent support for LBS-Applications. 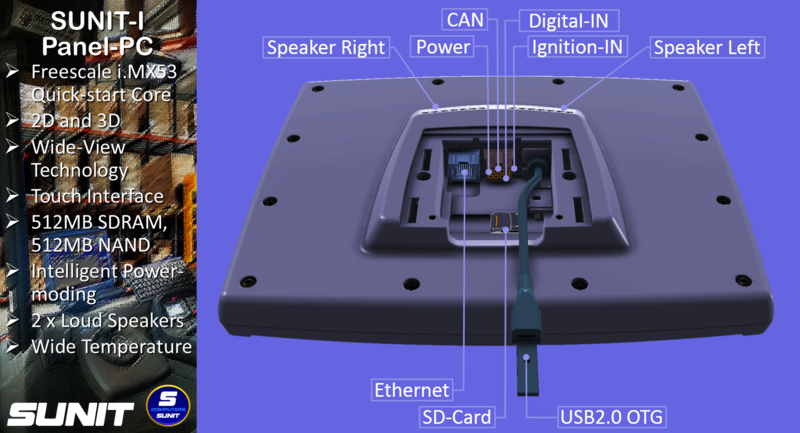 3-axis Accelerometer, High-Speed CAN and Digital I/O’s offers expansions for IoT-Applications. 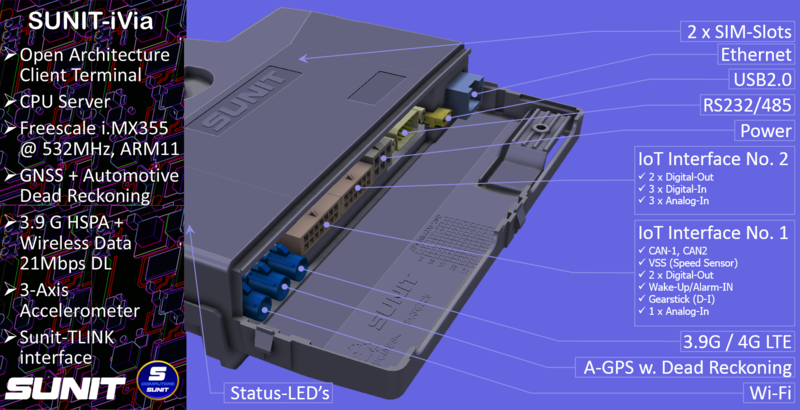 SUNIT-FC2 is powerful Low-Energy Computer for Tough works in On-Board and Industry. It serves Fleets, Industry, Logistics & Supply Chain, Vehicle Economy and Intelligent traffic systems. Automotive Dead Reckoning (ADR) with Super-sense GPS ensures accurate positioning. High-speed Modem, Wi-Fi and Bluetoot with Dual-Band serves safe Communication. 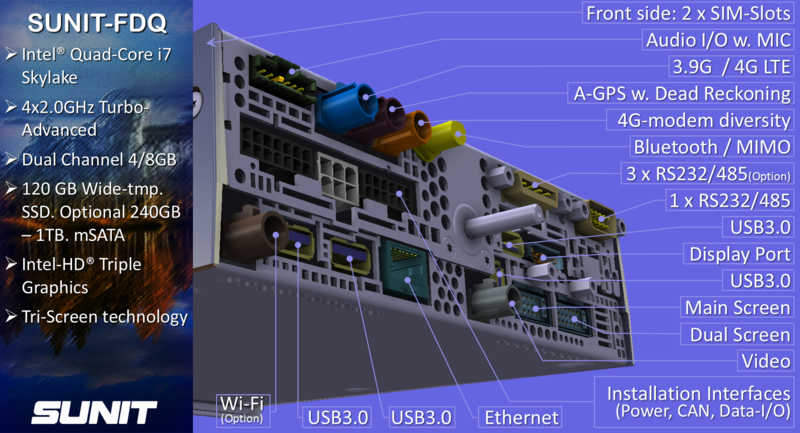 Gigabit Ethernet efforts rapid Network. HD Tri-graphic technology serve excellent On-Screen graphics. 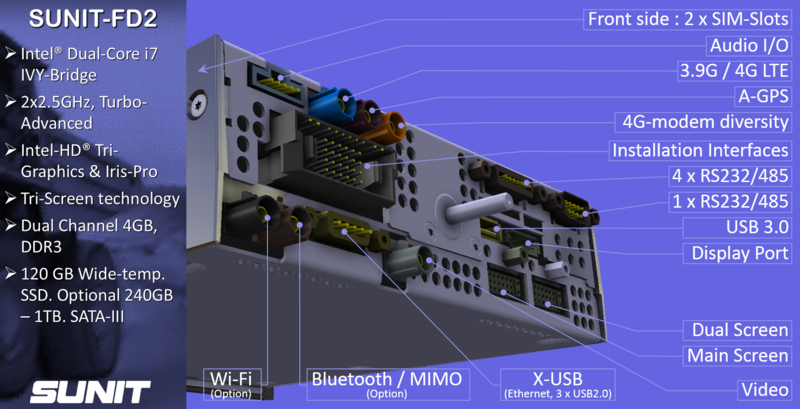 SUNIT-FQL - Energy-efficient Fanless Intel Atom Quad-Core Computer for Industry where Communication base on Short-Range technology as Wi-Fi, Bluetooth and Ethernet. Tough and light-weighted mechanics build on a geometrical cast aluminum technology and purpose-designed conformal coated electronics ensures long In-Service time. Wi-Fi and Bluetooth 4.2 with Dual-Band serves safe Wireless-Communication. Gigabit Ethernet efforts rapid File Transfer Network. SUNIT-FQL is excellent server for Fleets, Supply-Chain and Industry Automations. SUNIT-FQA -Fanless Energy-efficient Intel Atom Quad-Core Computer for Fleets and Industry. It builds on firm and light-weighted geometrical designed cast aluminium technology and purpose-designed conformal coated electronics. SUNIT-FQA delivers performance-computing in external range of Tough-environments and Temperature conditions. 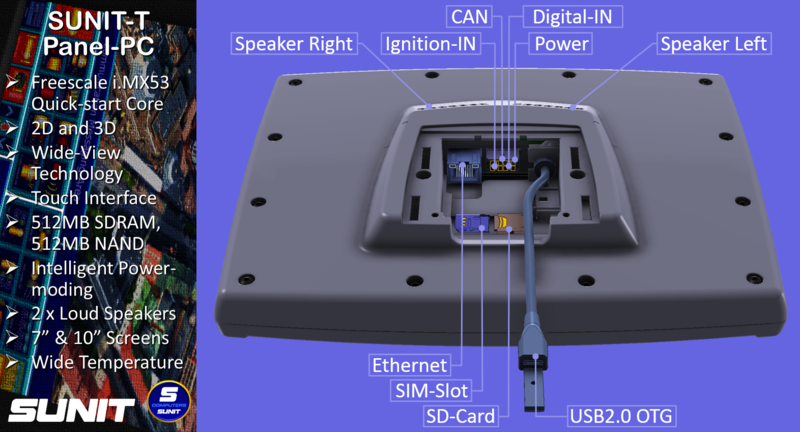 Interface computing-unit serves core insight IoT-Data, CAN, Sensors and Data-I/O’s . SUNIT-FQA is Cost-effective solution with optimal Performance. SUNIT-FD2. "Long-Rider" CPU. Intel i7 IVY-Bridge 2x2.5GHz. SUNIT-FD2 is High-capacitive Computer for Client-applications where the Duties calls for High-graphics, 3D, Multi-video Streaming, Multi-Screen technology and Integrated communication. SUNIT-FD2 is excellent server for challenging Application as Supply.Chain & Heavy-duties for On-Road, Off-Road and Industry. SUNIT-FDQ for Heavy-Duty. Quad-Core i7 Skylake 4x2.0GHz. New SUNIT-FDQ Quad-Core Computer continues our traditional F-serial Computer technology for the harshest environments. SUNIT-FDQ for applications where the Client calls for High-graphics, 3D, Multi-video Streaming, Dual or Tri-Screen technology and Integrated 2-way communication. Capacity-sene Speed-control of processor, we can proudly note that our technology for optimizing the Client-Application effort is in absolute top-class. HMI is supported by Intel HD Iris and Iris Pro smart Processor technology and Intel HD Audio. Sunit is proud to launch new 6th Gen. Intel Skylake Quad Core Processor family with the most powerful processor capacity, graphic, storing and I/O technologies and first of all without a rival the Life-Like Imaging and Audio technology; SUNIT-FMC “EAGLE-IRIS”. Capacity-sensie Processor-Speed control, we can proudly note that our technology leaves absolute top-class cpacity & space for Client-Applications. SUNIT-FMC unites Efficiency, Sharpness, Precision and Alertness in a compact package. It is discretely mountable for versatile purposes and serves certainly Applications. Firm design, Auto-ambient luminosity, quick response time and wide viewing are keys for screen with quality HMI for commercial Duties. The smooth Casing-design, crack-resistant Screen surface, tough and elastic formatting are characteristics that always highlights our Screens. Light and firm design enables a selectable placements. OSD (On-Screen-Display) technology opens new world for the HMI-technology. The OSD with Touch makes possible for third party applications outside traditionally O/S technology for e.g. CAN-Bus communications, Messaging's, etc. and Adjustments for Brightness, Contrast and Volume are now Screen-Individually . Click for see about our Applications and Drivers.